Rine Engineering Private Limited is one of the leading manufacturers and suppliers of customized sand castings and customized Grey iron casting. Our product range is of steel, iron and Grey iron castings with close tolerances. Today, with our knowledge and experience in the field, we are one of the reputed and preferred suppliers of premium quality Gray Iron, Ductile Iron & Steel casting products at highly competitive prices. Being a customer oriented organization, we strive to expand our business on the basis of customer satisfaction. With the upgraded infrastructure, we also have an efficient management team of qualified and experienced professionals. We strictly follow obligatory regulations, as stipulated by the authorities concerning environmental safety and human resource management. Vision Rine has a vision to be an industrial Front Runner in the Indian sub continent-to become preferred supplier of castings to world leading companies and want to be a Global leader. 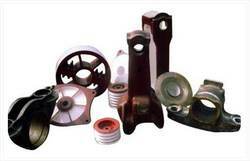 Our product range is of steel, iron and Grey iron castings with close tolerances. Today, with our knowledge and experience in the field, we are one of the reputed and preferred suppliers of premium quality Gray Iron, Ductile Iron & Steel casting products at highly competitive prices.